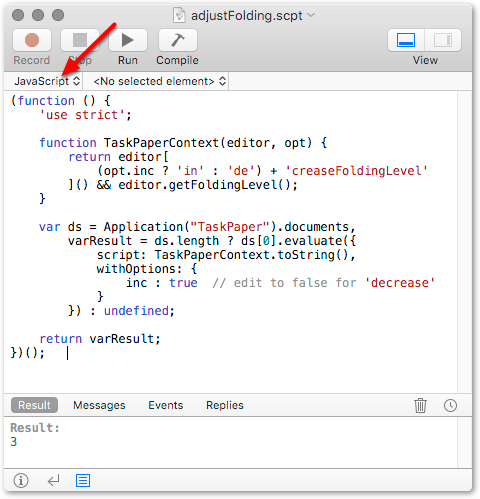 The TaskPaper 3 scripting interface gives direct support for increasing or decreasing the overall fold level of the document. Here is one way of increasing the folding level. You can make a second copy and derive a decrease folding level script by editing the value of inc from true to false in the withOptions section. (The script returns the resulting folding level as an integer, in case you want that for something like a Keyboard Maestro notification). I’ve updated the code (above) for the current version of the API. Thx, I found it in menu.